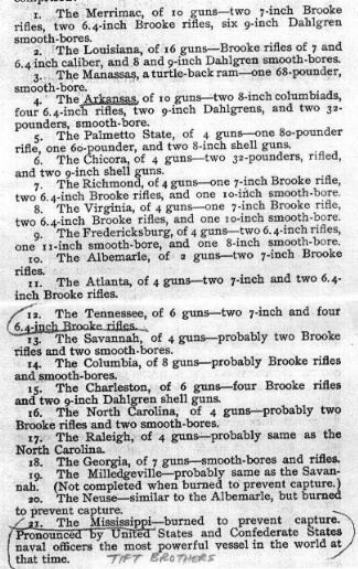 and a listing of Ironclad ships with guns. Capt. 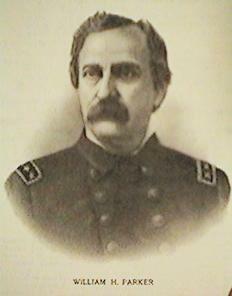 William Harwar Parker, CSN. general idea of the services of the Confederate Navy. clads equal to any in the world at that time. So much for the materiel. As for the personnel, Prof.
most gallant episodes of the war." 2. The small gunboats at the battle of Hampton Roads. 3. Isaac Brown in the ram Arkansas. 4. J. W. Cooke in the little Albemarle. 6. Pelot's capture of the Waterwitch. 7. Glassell's torpedo attack on the New Ironsides. 8. Davidson's torpedo attack on the Minnesota. 9. Semmes' admirable management of the Alabama. 10. Maffitt's dash at Mobile and his after exploits. 11. Read in the Tacony, and his dash in the Webb. 12. Capt. John Wilkinson as a blockade-runner. 13. Brooke's design for the Merrimac and his rifle-gun. 15. Catesby Jones' cannon foundry.